﻿ Orbital Cloud « Haikasoru: Space Opera. Dark Fantasy. Hard Science. The ORBITAL CLOUD giveaway contest winners! It’s the ORBITAL CLOUD Giveaway contest! In 2012, Fujii self-published Gene Mapper serially in a digital format of his own design, and it became Amazon.co.jp’s number one Kindle bestseller of that year. The novel was revised and republished in both print and digital as Gene Mapper—full build—by Hayakawa Publishing in 2013 and was nominated for the Nihon SF Taisho Award and the Seiun Award. 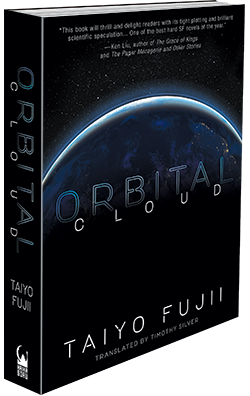 His second novel, Orbital Cloud, won the 2014 Nihon SF Taisho Award and took first prize in the "Best SF of 2014" in SF Magazine. His recent works include Underground Market and Bigdata Connect. Three minutes later, SAFIR 3’s second stage disappeared beneath the eastern horizon, and the brief show came to an end. Reviewing the video, Ozzy found that the light had flashed five times in total, including a couple of flashes he hadn’t noticed. Now things were getting interesting. What was the most sensational way to report his findings? A weapon, he decided—that would be the most suitable for X-Man, who was well known as a kook. NASA and the professional astronomers would be sure to ignore his outlandish claims, and the stuffy astronomy community was starting to catch on as well. “There he goes again with his crazy theories,” they’d say. Fine—let them talk. All Ozzy wanted was for people to look up at the sky. Geeple would run the story. Their geeky audience would love it. That B movie about a superweapon that rains giant tungsten warheads on Earth from orbit! Awful film, of course, rumored to have wasted half its budget on the lead actor. The critics hadn’t thought much of it, but any self-respecting geek would remember it. Okay, so this object was a Rod from God. What was its target? Since the rocket was Iranian, probably Israel or the United States, but a Rod from God aimed at the Earth wasn’t very original. Better to twist the narrative and say it was headed for…the ISS. Now that would be out there. Best of all, the average reader would have no idea how unlikely it was. Ozzy quickly sketched a cylinder with a few thrusters sticking out, then took a photograph with his cell phone and uploaded it to MegaHands, a job-matching site with a thousand-dollar reward for the best image. Freelance illustrators with Hollywood aspirations would be all over it. He hadn’t been able to take a gigapixel photo, but stills captured from the video would be enough for Geeple. He’d put the original images and the radar observation data up on his blog, the Seychelles Eye. The professional-looking data would be enough in itself to make the story seem reliable. He accumulated more data every day than he knew what to do with—might as well make some use of it, even if only as decoration. Oh, and one more thing—a complaint to Meteor News. They’d almost made him miss his chance to photograph SAFIR 3 accelerating.